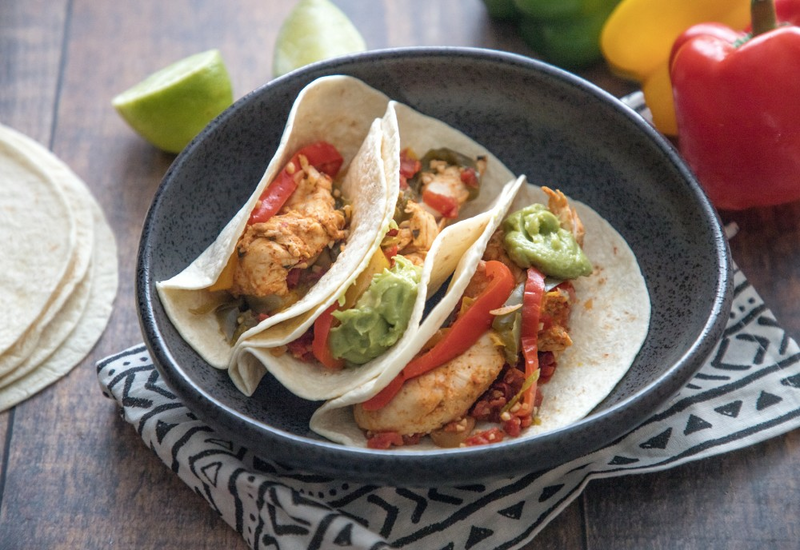 You can have chicken fajitas on the dinner table in 30 minutes thanks to this pressure cooker recipe for chicken fajitas. Season the chicken with fajita seasoning and then sear; add bell peppers, onion, and garlic and pressure cook for only 4 minutes! Top the fajitas with your favorite toppings like guacamole, cheese, or salsa. Stir chicken and taco seasoning together in a bowl until chicken is evenly coated. Set pressure cooker to Sauté on Normal. When it reads "HOT", add oil. Sear chicken tenderloins until browned, about 2 minutes per side. Press the Cancel button to turn off the Sauté function. Add tomatoes, bell peppers, onion, garlic, and lime juice to chicken; season with salt and pepper. Lock pressure cooker lid in place and set steam vent to Sealing. Select Poultry and cook on High Pressure for 4 minutes. Set steam vent handle to Venting to quick-release pressure. Press Cancel. Press the Sauté button on Normal and cook the chicken and bell peppers until liquid is reduced and desired consistency is reached, 2 to 4 minutes. Use a slotted spoon to transfer chicken and bell peppers to tortillas. Use chicken breasts instead of tenderloins if you already have them on hand! Just cut the breasts from top to bottom into 1/4-inch thick strips. The cook time will be the same. Substitute flour tortillas for the corn tortillas if desired! You can buy the pre-made taco seasoning or make your own for a fresh, preservative-free version. Per Serving: 530 calories; 15g fat; 20.9g carbohydrates; 75g protein; 199mg cholesterol; 760mg sodium. Yum. Definitely liquidy but like the author said, just use a slotted spoon to drain off before building your tortillas! Tasty but very runny. Probably will make a good soup for leftovers. Very easy. Only used half the peppers, onions and tomatoes in the multipot with the chicken — the rest we kept whole and chopped as toppings. Kids loved it! Tasted great, but very watery. I had to put the chicken and veggies in a strainer. Good news, I’m going to use the liquid from this in a veggie soup.